Big Data Hadoop training course in Phoenix City lets you master the concepts of the Hadoop framework and prepares you for Cloudera’s CCA175 Big data certification. With our online Hadoop training, you’ll learn how the components of the Hadoop ecosystem, such as Hadoop 2.7, Yarn, MapReduce, HDFS, Pig, Impala, HBase, Flume, Apache Spark, etc. fit in with the Big Data processing lifecycle. Implement real-life projects in banking, telecommunication, social media, insurance, and e-commerce on CloudLab. Who are eligible for taking this Big Data Hadoop Training Course in Phoenix? How will this Big Data Training help in scaling up your career in Phoenix City? 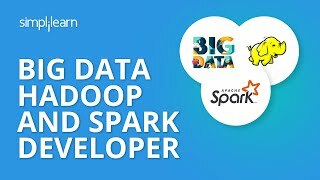 How will i become Certified Hadoop Developer in Phoenix? What are the Benefits of Taking Big Data Hadoop Certification Course in Phoenix? What is the Duration of Simplilearn's Big Data Hadoop Certifications Training Course in Phoenix? How Much does the Course Cost in Phoenix? Simplilearn’s Hadoop certification training course is priced at $799 for Online Classroom Flexi-Pass. What are various Big Data Hadoop Roles available in the Phoenix? 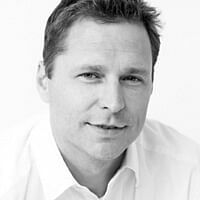 What is the market trend for Hadoop in the Phoenix? What are the top Companies offering Big Data Developer, its related Jobs in Phoenix? Several companies in Phoenix are on the lookout for Big Data professionals. According to Indeed, some of the top companies looking out for big data professionals in Phoenix are Amex, Intel, Honeywell, IBM, Oracle, PWC, SAP. L3 Tech, Carvana etc. What is average salary for a certified hadoop developer in Phoenix? 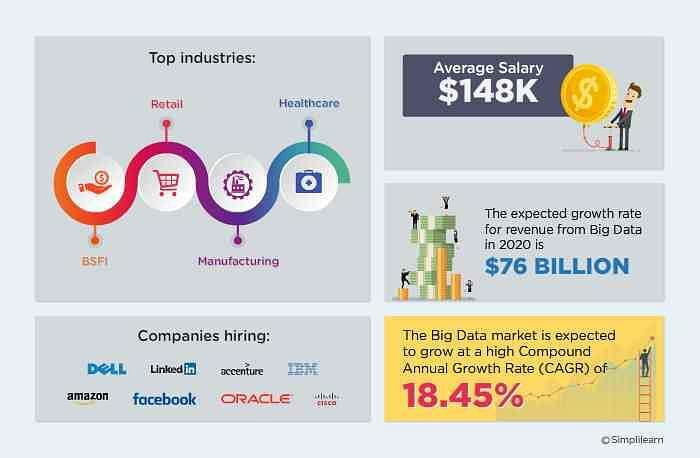 According to ZipRecruiter, entry-level big data professionals in the U.S. can earn $76,000 per year. However, a big data professional with experience can earn up to $127,000 in the Phoenix. However, this salary can go up to $158,000 in Georgia state. What are the System Requirements for attending bigdata training from Phoenix? What are the modes of training offered for this course from Phoenix? What are the other top Big Data Certification Courses Simplilearn is offering for managers, developers, freshers in Phoenix? Phoenix is the capital of Arizona. The IT, telecommunications and Finance sectors power the city’s economy. Some of the largest employer firms in this city are Bank of America, JPMorgan, American Express and Apollo Group. Apache Hadoop is a platform that allows you to process and analyze large datasets stored for analysis. After taking Simplilearn’s Hadoop course in Phoenix, you will be able to master real-time data processing using tools like Spark. Becoming an expert in Hadoop will enable you to fully understand data in order to be more intelligent about your business. Data Scientists have the potential to earn up to $140,000 in America and are in demand throughout the world. Simplilearn is powered by the Apache Software Foundation and offers a Hadoop certification course in Phoenix. If you’re interested in becoming a data scientist, Simplilearn’s learning delivery model combines the personal motivation of live virtual classroom instruction with the reinforcement of relevant practical projects. Our experts will ensure that you understand various aspects of the Hadoop Distributed File System (HDFS). If you ever have any questions about your training, the support of our 24/7 live teaching assistants is another benefit of learning with Simplilearn. Programmers interested in becoming a data scientist need to be proficient in Hadoop. Let Simplilearn help you make the most of your current or future data analysis career with an intensive training course for Hadoop certification.